An emerald ash borer adult. 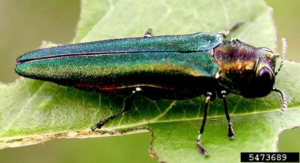 A statewide quarantine of the invasive insect emerald ash borer (EAB) will go into effect on March 30, 2018. Previously, individual counties were quarantined when EAB was confirmed within each’s borders. 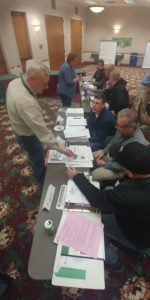 Since EAB has been found in 48 of 72 Wisconsin counties, officials have determined that statewide regulation of the devastating ash tree pest is warranted. For further information on EAB in Wisconsin, visit https://dnr.wi.gov/, using key words “emerald ash borer”. Fire season is just beginning. 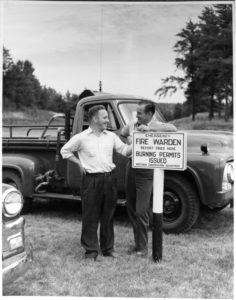 Each year an estimated 1,100 wildfires burn in DNR protection areas (about half the state, generally the more forested areas) and another estimated 2,500 wildfires burn in parts of the state where fire departments are the primary responders. Two-thirds of these fires occur in spring. There is a great deal of dry vegetation and fallen leaves and other debris present this time of year, which is quick to dry out. Accompanied by warmer weather, drops in humidity and gusty winds, wildfires can quickly ignite and spread. So far this year, 57 fires have occurred in DNR Protection Areas. Main fire causes have been debris burning and equipment. Fourteen homes and 12 outbuildings have been threatened by these fires and 3 outbuildings have been destroyed. “When we see land as a community to which we belong, we may begin to use it with love and respect.” Aldo Leopold spoke these words many years ago, but they still ring true today. We all belong to a community, built around the people and the places we love and feel connected to, including trees and the land. Trees help shape communities and create sentimental landmarks that connect people and places. Consider the large elm that may hold a family tire swing, or the oak that made the perfect place for a secret club house, perhaps it’s under a crabapple tree that a couple shared their first kiss, trees becomes fixtures in our lives, bookmarks for the moments we relish.